Halo Top, a health-conscious ice cream brand marketed to yogis, is facing a lawsuit for selling its only product: low-calorie ice cream. A New York man named Josh Berger filed the suit on grounds of a deceptive marketing practice, accusing Halo Top of tricking him into buying the reduced-guilt ice cream when he expected a "normal" desert in the vein of Dreyer's or Häagen-Dazs. Given the suit, filed in a Brooklyn federal court, it would be reasonable to wonder how Berger missed the whole low-calorie thing. Halo Top's calorie counts are featured front and center on its ice cream pints, and its website proudly lists how it stacks up to the competitors on the calorie scale. The brand's surge to the most popular ice cream pint in America is pretty much attributed to its low-fat content, yet traditional ice cream taste. But despite all this, Berger is pressing on with a suit against Halo Top parent company Eden Creamery. The suit alleges the brand engaged in "false, deceptive, and misleading” labeling of a pint that Berger purchased in 2017 for $6.99. Now, Berger is primed to enter a legal dogfight that will likely cost him far more money. 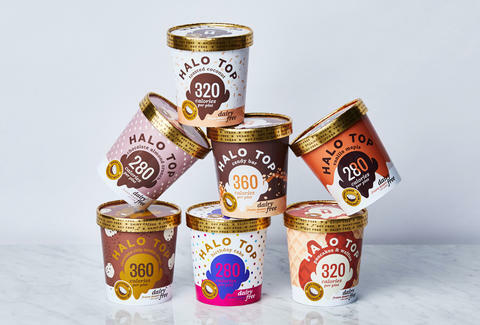 "The brand name 'Halo Top' is misleading because consumers often associate the word 'Halo' with the color yellow, consistent with common dictionary definition which refers to it as a disk or circle of light surrounding or above the head of a saint to represent their holiness. Consumers also know that yellow is the color associated with butter and cream, because of the milk produced by pasture-raised and forage-eating cows." It's unclear what kind of compensation Berger seeks at the moment. We wish him the best of luck in his future ice cream endeavors.